All teams love the idea of home-field advantage and riding the support of a hometown crowd to victory. 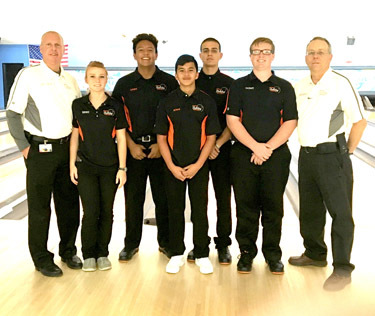 The Artesia High School bowling team was no different at last week’s Artesia Bulldog Invitational and took full advantage of their home surroundings by capturing the championship in both the Advanced and Novice divisions. The strong showing by the Bulldog bowlers is further recognized in the fact the Invitational saw 16 schools, 41 teams and 210 bowlers compete throughout the four divisions of the New Mexico High School Bowling Association. The Bulldog Advanced team scored their first Advanced-division win of the season, jumping out to a fast lead by rolling a 1,034 game and following it up with a solid 945 for a two-game total of 1,979. After the two-team game section of the tournament, the Bulldogs led Cleveland High School by five pins heading to the seven-game, Baker-system format. Highlighted by a first-game 225 and a fourth-game 256, the Bulldogs averaged 195 for seven Baker games to capture the third Advanced championship in school history. Leading scorers for the Bulldogs were Will Davis (230/217), Ethan Velo (237/182), Jamey Palomares (219/197), Ricardo Aguirre (209/163) and Coy Moorhead (164/161). 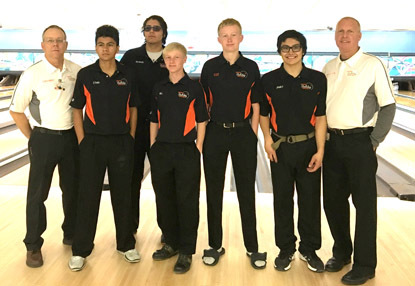 The Bulldog Novice team defeated Manzano by rolling team games of 820 and 707, and solidifying their first-place position with a final-game Baker score of 189. “To see a young team step up and throw three strikes in a row twice in a game that they knew they had to have was pretty impressive,” said Clayton. Top scorers were Zachary Issacs with high games of 232 and 193, Kenan Hernandez (183), Sheree Yandell (172/160), Eduardo Anaya (159) and Xavier Ybarra (135). All 30 AHS bowlers competed in the Bulldog Invitational, with many achieving both season- and career-high scores. Leading the remainder of the Artesia team were Darian Mahan (190), Chris Burnside (189), Tim Boone (186), Kenley Ortega (184), Josiah Waller (179), Alyssa Steed (175), Houston Branch (174), Zachary Ingram (173), Elijah Lopez (171), Bryce Pollard (170), Andres Lopez (152), Katie Safka (149), RJ Lewis (148), Andy Powers (146), Alexis Gomez (142), Sammy Bejarano (133), Jaiden Atole (122), Brittany Schneider (116), Ana Wageley (114) and Faith Kraft (97). “We look at more than the divisions we win, because with six AHS teams competing in the Advanced, Intermediate and Novice divisions, we have two and sometimes three Bulldog teams competing against each other,” said Clayton. “Top to bottom, this team is as good as we have had in a long time.